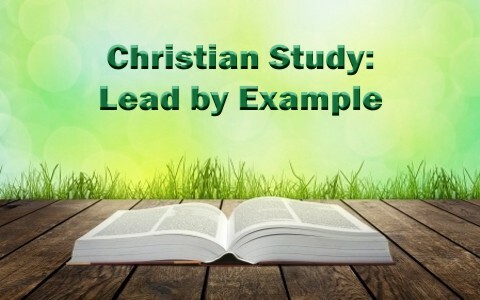 Does the Bible address the idea of leading by example? If so, what verses show this and what can we learn from them? Is there any greater example in all the Bible than Jesus Christ? Certainly not. When Jesus was speaking to His disciples shortly before He was to die on the cross He told them “I have given you an example, that you also should do just as I have done to you. Truly, truly, I say to you, a servant is not greater than his master, nor is a messenger greater than the one who sent him” (John 13:15-16). What was it that Jesus had just done? He had just finished washing the disciple’s feet! Talk about an example of being a servant. He even washed the feet of the one who would betray Him (Judas). The disciples should have been the ones that had done this in the first place because usually the one who was the most humble or the lowliest in the home washed the guest’s feet…typically a bond servant. Jesus showed them that even the God-Man could descend to humble Himself to be a servant in the hopes that they should do likewise. Paul told the Christians in Rome to “Let each of us please his neighbor for his good, to build him up. For Christ did not please himself, but as it is written, ‘The reproaches of those who reproached you fell on me’” (Rom 15:2-3) so Christ’s example showed that He was willing to take the reproaches of men which we deserved, to leave us an example proving that we “have an obligation to bear with the failings of the weak, and not to please ourselves” (Rom 15:1). Jesus even left us an example for how we are to handle suffering as Peter wrote that it’s for this reason that we “have been called, because Christ also suffered for you, leaving you an example, so that you might follow in his steps” (1 Pet 2:21). For another “example of suffering and patience…take the prophets who spoke in the name of the Lord” (James 5:10). Paul wrote to Timothy “I received mercy for this reason, that in me, as the foremost, Jesus Christ might display his perfect patience as an example to those who were to believe in him for eternal life” (1 Tim 1:16). No other apostle or man that I know of suffered more than Paul with the exception of Christ. He wrote to the church at Philippi “Brothers, join in imitating me, and keep your eyes on those who walk according to the example you have in us” (Phil 3:17) so “Let those of us who are mature think this way, and if in anything you think otherwise, God will reveal that also to you.” (Phil 3:15). Here Paul gives us two different sources for which we are to follow; “join in imitating me” and “keep your eyes on those who walk according to the example you have in us.” The point is that every believer should have someone to look up to as a Godly example and follow their example as long as they are walking with God and if they are “walking according to the example” given by Paul and since we know that Paul was obedient to Christ, these should be our examples after Christ’s own example. Even to the Thessalonians Paul said “It was not because we do not have that right, but to give you in ourselves an example to imitate” (2 Thess 3:9). What example “in ourselves” in Paul’s company was he talking about? Just before this line he wrote “For you yourselves know how you ought to imitate us, because we were not idle when we were with you, nor did we eat anyone’s bread without paying for it, but with toil and labor we worked night and day, that we might not be a burden to any of you” (2 Thess 3:7-8). Paul’s example was that he was not idle. He had the right to be supported yet he was a tent-maker and raised his own money for his own support. This example shows that we are to “keep away from any brother who is walking in idleness and not in accord with the tradition that you received from us” (2 Thess 3:6b). We should all work hard to support ourselves and the ministry. We should follow Paul’s example in being a servant for Christ and we must keep our eyes on those who set a sterling example who are walking according the example given by Paul (2 Thess 3:9; Phil 3:15, 17). That’s why Paul wrote “If anyone is not willing to work, let him not eat” (2 Thess 3:10) because that is a horrible example to leave for other believers and for unbelievers too. We certainly cannot leave out the Christian’s example that leaves a huge impact on so many. I remember an older mentor of mine, now with the Lord, who was still so very humble even though he held a doctorate. This fine Christian man was such an example to me that just because you are an expert in the field of theology it doesn’t mean that you have to be full of yourself. This man was one of the most brilliant men I knew and one who knew the Bible better than anyone else I knew about, yet he was so soft spoken, never openly corrected anyone (the exception was with heresy) and remained humble up until his dying day. Paul knew of a church that set a wonderful example for the other churches when he was writing about the Thessalonians “And you became imitators of us and of the Lord, for you received the word in much affliction, with the joy of the Holy Spirit, so that you became an example to all the believers in Macedonia and in Achaia. For not only has the word of the Lord sounded forth from you in Macedonia and Achaia, but your faith in God has gone forth everywhere, so that we need not say anything” (1 Thess 1:6-8). So not only had the church’s example of suffering patiently spread to him but to all believers, including those in Macedonia, Achaia, and in fact had “gone forth everywhere” but how was this possible? Paul wrote that it was only possible because they had “became imitators of us and of the Lord” (1 Thess 1:6). When the Jerusalem church went through severe famine and hunger, the Macedonians came to the rescue and that’s why he wanted to share this with the church at Corinth by writing that “the churches of Macedonia, for in a severe test of affliction, their abundance of joy and their extreme poverty have overflowed in a wealth of generosity on their part. For they gave according to their means, as I can testify, and beyond their means, of their own accord, begging us earnestly for the favor of taking part in the relief of the saints” (2 Cor 8:1b-4). The Corinthian church must have been a great example of generosity too because Paul says he came “to write to you about the ministry for the saints, for I know your readiness, of which I boast about you to the people of Macedonia, saying that Achaia has been ready since last year. And your zeal has stirred up most of them” (2 Cor 9:1-2). So the church in Macedonia had set an example of selfless giving and had inspired the church in Corinth and Paul complimented them for that and then the church at Corinth had done the same thing so he shared this with the church in Macedonia. Every believer gives an example for other Christians and for those who are not saved. It is either a good example or a bad one. It either glorifies Christ and His church or it can come dangerously close to blaspheming God’s Good Name. Christians…we might be the only Bible unbeliever ‘s will ever read so live it out, follow Christ’s example of being a servant, follow Paul’s example of obedience to Christ and suffering, follow a good Christian’s example in walking with Christ and be that good example because surely someone is watching and I’m not just talking about people. Related reading about leadership: What is Servant Leadership? Thanks Jack H my brother. Always the encourager aren’t you. I thank God for you and yes, you are right about these things being deficient in society, especially among celebrities and in the sports world where we have examples but they are typically bad ones.